It’s an old saying. I don’t know where it came from. The meaning is that family relationships are more important than any other. You’re supposed to be loyal to your family first and foremost, because “They’re blood”. The genetic familial bond is deep and powerful. Use your imagination for a moment. Imagine you have an acquaintance who routinely cuts you down, employs guilt trips or unreasonable expectations to get you to do what they want, yells when you let them down, or tells you that you don’t measure up to their expectations. Perhaps they aren’t as directly difficult to handle, but many of the conversations you have with them feel “off”, like they’re doing something inappropriate, but you can’t quite put your finger on it. How much time would you want to spend with this person? How often would you want have them over, or pay them a visit, “just to catch up”? Would you want to take your kids over to their house and leave them in this person’s care for a few hours while you went on a date with your spouse? And yet as a relationship therapist, I routinely see people who place themselves and their children in the path of people who relate in these hurtful ways. These are not reckless or foolish people. They are common, everyday folks who care about their families and friends, who are careful parents and thoughtful about their choices. And yet, when I ask them why they would want to make themselves or their children vulnerable to someone who treats others so harshly, they reply, “It’s important to maintain a connection with this person! The kids need to have this relationship.” All the while they acknowledge that they feel the pain of being treated this way, and though they feel like withdrawing, they refuse to do so. Parents acknowledge that the way the people in question treat their children to is inappropriate as well. They feel a protective instinct, but routinely squash that instinct in favor of maintaining the connection. “I have to put up with it and do damage control after. Except it’s not. And it is. Let me explain. Because a person is related to you by blood does not give them carte blanche to treat you as they will. It does not mean you have to take whatever they say or do no matter what. It does not mean you MUST maintain connection with them in spite of the history and/or ongoing damage they do in their recklessness. 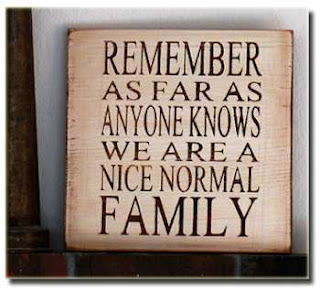 If you wouldn’t put up with it from a friend, acquaintance, or stranger, you don’t have to put up with it from family. Period. The difference between “blood” and “not blood” is not what we have to put up with, it’s that we keep on reaching for healing. It’s not that we accept whatever they have to offer, but that we hold out for healthy relationship. We don’t give up on the relationship quickly, but we also don’t settle for less than what it is supposed to be: healthy, mutually affirming, encouraging, strengthening. We resist recklessness in family relationships more than in any other precisely because they are so important.